Anyone who knows me knows my obsession with the bubbly. I like other wines and cocktails and even the occasional beer too (I mean, I don't discriminate my alcohol), but there's something about a nice glass of champagne that just makes me happy. However, I will make an exception if it's particularly fresh and delicious, and this one certainly fits the bill for a boozy August brunch. Because, as my mom captured on a restaurant window recently: "A brunch without mimosas is just a sad, late breakfast." I had some leftover watermelon and mint from my previous post, the Watermelon Skewers with Mint, Feta and Cucumber (which you should also totally make), so a Watermelon Mimosa seemed like the right thing to do. Ok, so I'm not doing a step by step for this post, because essentially it would just be photos of me blending up watermelon. And I really hope you are proficient with a blender so I'm not going to insult you with instructions on how to do that. What I am going to do is give you the recipe and hope you make the right decision and make this. Immediately. You're welcome. (Side note: the watermelon juice is also really fabulous with gin or vodka. Just sayin'). 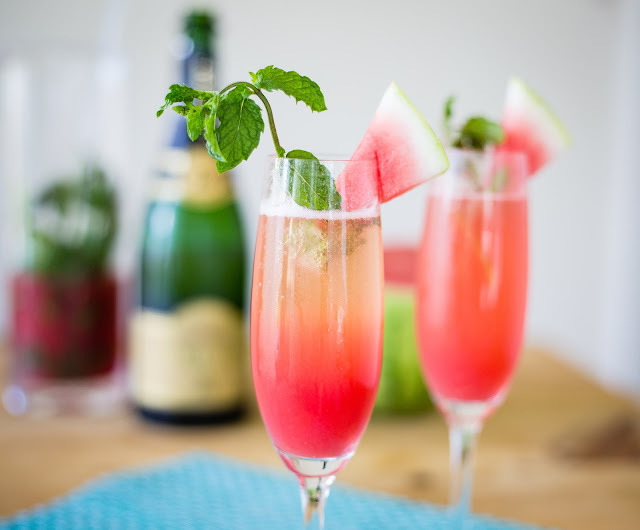 Blend watermelon, lime juice, and sugar or simple syrup (if using) and puree until smooth. Using a fine mesh strainer, strain to remove solids. Transfer to pitcher. Rub some of the mint leaves between your fingers to release oils and submerge in the watermelon mixture. Place in the refrigerator for 2 hours or overnight. To make mimosas: Remove mint from the mixture. Pour a little bit in a champagne flute (about 1/3 of the glass) and top with champagne. 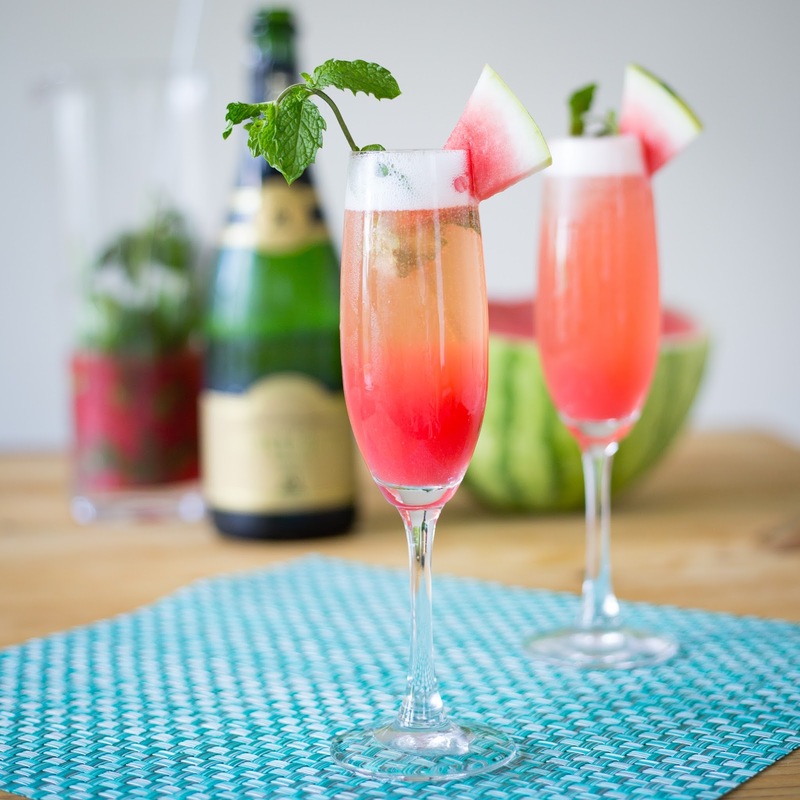 Garnish with sprig of mint and a small watermelon slice. These look marvelous! So creative and that color is absolutely gorgeous!